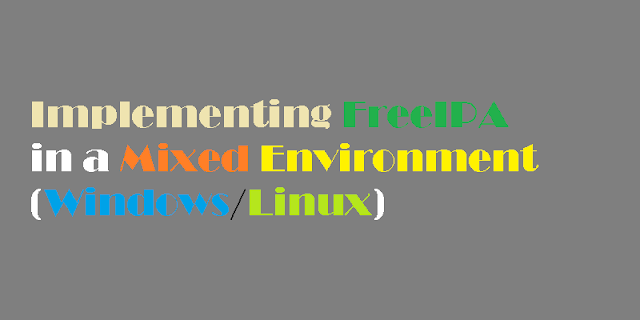 This article is a practical step by step guide to implement freeIPA in mixed environment (Windows/Linux Clients). You should also refer the Installation and Deployment guide of FreeIPA directory server on CentOS 7 from the following link. The Installation has been performed on the following environment. Server: Single IPA server (Fedora 10 x86_64) with 2G RAM 1.6 GHz Intel Dual Core processor. Note: Please be careful about the firewall and selinux policies before continuing with the configuration. In windows also you should open the necessary ports to communicate to the IPA Server or disable the firewall if you are doing a test setup. Please refer the installation and deployment guide to get more details about the ports required for IPA. 1. Installation of the IPA Server. The IPA server may show a conflict with mod_ssl package. IPA uses mod_nss in apache. You can remove the mod_ssl for the time being. 3. Run the following command to configure the IPA Server for you environment and follow the instructions. Here the DNS Server is on the same machine. Please note that kerberos server has very specific DNS requirements, if you have a DNS server already on your network add the SRV records of the kerberos, ntp and ldap server to that. A sample zone file will be created in your /tmp directory after the ipa-server-install, do a copy paste of all the SRV record from this file to your zone file. If you have a chrooted bind installed, the named service start-up may fail after the ipa-server-install . Do the following configuration to setup DNS properly. b. Copy the zone file to the proper location and create a reverse zone file also. No need to change anything in the forward zone file, create a reverse zone as follows. 4. Check whether the ntp time synchronization is proper, if you don't want to sync to an external time server, configure a local time server and synch all the clients to that. Sample configuration file for an ntp local server. 5. Make sure that all the required services are enabled in your run level and reboot the IPA server (krb5kdc, ntp, named, httpd, dirserv etc). This will be configured automatically when you run the ipa-server-install, anyway just do a second check. 2. Make sure that the client is synchronized to the ntp server. 3. On the IPA Server add the host principal and set the password for the xp client. e. You will see "EXAMPLE.COM (Kerberos Realm)" in the windows logon drop down menu. HERE IS THE TRICK, PLEASE NOTE THAT THE USER IS REQUIRED TO LOGIN USING “USER@REALM” (testuser@EXAMPLE.COM) INSTEAD OF JUST THE USER NAME FOR THE FIRST TIME.